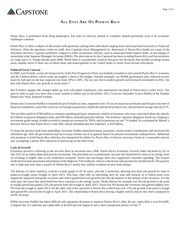 This PDF 1.7 document has been generated by Adobe InDesign CC 2014 (Windows) / Adobe PDF Library 11.0, and has been sent on pdf-archive.com on 26/11/2015 at 03:04, from IP address 68.195.x.x. The current document download page has been viewed 309 times. File size: 282 KB (11 pages). a few weeks the territory will default on some of the $70 billion in debt it owes. If U.S.
problem, Puerto Rico may very well suffer an economic depression. Puerto Rico is trapped in a vicious cycle. that we believe bookend the possibilities. with a missed payment due in December. 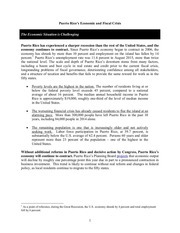 its peak of well over 3.8 million in 2004.
credit that would incent more work by lowincome Puerto Ricans. resumes in earnest by the end of the decade. recession. While net out-migration continues, it occurs at a much more modest pace. lower its high business costs are adopted. slide ending any time soon. transparency, and impose fiscal discipline. While the administration’s efforts to resquarter century. in 2014 investment had fallen to $7 billion. with more than 30% nationally. down from 16,000 before the recession. *Excludes $2.9 billion in Senior Pension Funding Bonds issued by the Employees Retirement System, $1.2 billion in Children’s Trust bonds, and approximately $1 billion in numerous other small bonds. it stopped paying on many of its other bills. cash to the government, at any interest rate. Puerto Rico is locked out of capital markets. The budget arithmetic is overwhelming. $10.2 billion in expected available revenue. its Medicaid spending, forcing additional further cuts to other government spending. the resumption of regular debt payments. There would also be considerable uncertainty around all of this. labor force; labor force participation falls below 40%, the lowest by far across all states. million currently to 3.3 million by 2020.
to meet their obligations to beneficiaries. push their impasse as far as the scenario envisages, it is conceivable that they will. very heavy debt load to carry, but it is manageable, and thus sustainable. Medicaid expenditures than U.S. states. income support to low-income workers. restart Puerto Rican economic growth. free, and would need to be covered by U.S.
to be close to $2 billion per annum in today’s dollars. toward the end of the decade (see Table 6). by 2020. Net out-migration remains substantial, but does abate, allowing the population declines to moderate. reforms needed to make the island an attractive place to do business. tervene again if the island appears to be going sobering one. sion by an otherwise sovereign government. lowing Puerto Rico into Chapter 9 banka serious error. U.S. lawmakers should act. U.S.-built ships. This significantly raises the costs of shipping between the U.S. mainland and Puerto Rico. was prepared by a working group appointed by Puerto Rico’s governor. 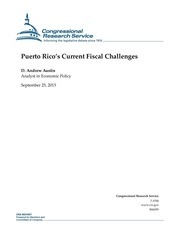 4	This view is expressed in “The Budget and Economic Outlook for Puerto Rico,” testimony before the Senate Finance Committee by Douglas Holtz-Eakins, September 29, 2015.
much as under the pessimistic default scenario, but its recession continues on through the remainder of the decade. 6	This is as of September 2015, according to the Commonwealth’s Financial Information and Operating Data Report, November 6, 2015.
than GDP, as the island experiences significant net outflows of income, primarily because of income earned at multinational pharmaceutical and tourism-related companies operating on the island. 8	A description of the Moody’s Analytics regional econometric models is available upon request. 9	See “Banks Can Absorb Puerto Rico Default, but Vulnerable to Its Economic Woes,” Moody’s Investors Service report, September, 28, 2015.
various tax and government spending policies and assessed the appropriate monetary policy response to bubbles in asset markets. stimulus, financial regulatory reform, and foreclosure mitigation. outlets, and is a frequent guest on CNBC, NPR, Meet the Press, CNN, and various other national networks and news programs. with his wife and three children in the suburbs of Philadelphia. and international business from New Mexico State University. This file has been shared by a user of PDF Archive. Document ID: 00317451.